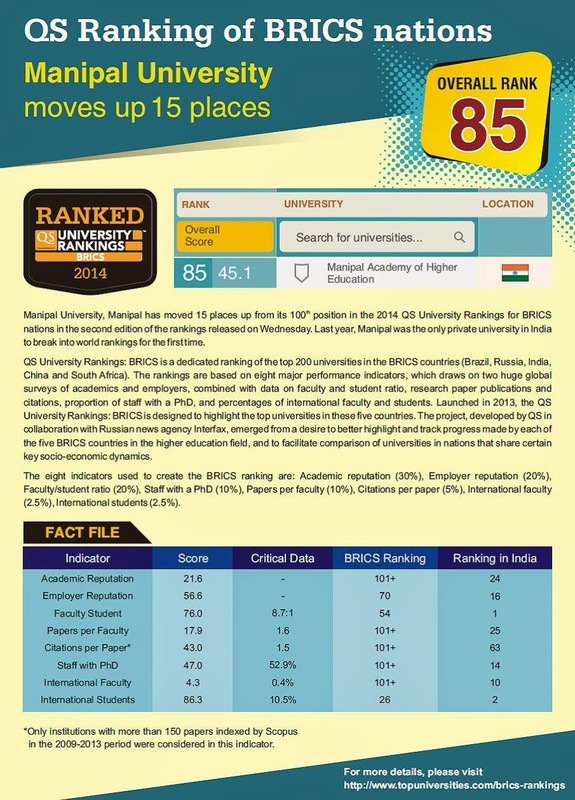 Manipal University, Manipal has moved 15 places up from its 100th position in the 2014 QS University Rankings for BRICS (Brazil, Russia, India, China and South Africa) group of countries.nations in the second edition of the rankings released on Wednesday. QS University Rankings: BRICS is dedicated ranking of the top 200 universities in the BRICS countries (Brazil, Russia India, China and South Africa). The rankings are based on eight major performance indicators, which draw on two global surveys of academics and employers, combined with data on faculty and student ratio, research paper publications and citations, proportion of staff with a PhD, and percentages of international faculty and students. Last year, Manipal was the only private university in India to break into world rankings for the first time. Launched in 2013, the QS University Rankings: BRICS is designed to highlight the top universities in these five countries. The project, developed by QS in collaboration with Russian news agency Interfax, emerged from a desire to better highlight and track progress made by each of the five BRICS countries in the higher education field, and to facilitate comparison of universities in nations that share certain key socio-economic dynamics. The eight indicators used to create the BRICS ranking are: Academic reputation (30%), Employer reputation (20%) , Faculty/student ratio (20%), Staff with a PhD (10%) , Papers per faculty (10%) , Citations per paper (5%), International faculty (2.5%) , International students (2.5%).